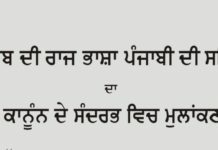 The 30th December, 1967 No.4629-JLg-67/38442 – In exercise of the powers conferred by Section 4 of the Punjab Official Language Act, 1967 the Governor of Punjab is pleased to direct that with effect from the 1st of January, 1968 Punjabi shall be used in administration at and below the District level in Punjab. Chandigarh, dated the 9th February, 1968. No.861-ILG-68/4661 – In exercise of the powers conferred by section 4 of the Punjab Official Language Act, 1967, the Governor of Punjab is pleased to direct that with effect from the 13th of April, 1968, Punjab (in Gurmukhi Script) shall be used in administration at the State level in Punjab. Dated Chandigarh, the 18 Oct. 1980 13 No.4224-4/1/78-IEd. (5) /3490 – In exercise of the powers conferred by section 6-A of Punjab Official Language Act, 1967, (Punjab Act No.5 of 1967), The Governor of Punjab is pleased to specify the First November, 1980, as the date for the purpose of the aforesaid section. Commissioner & Secretary to Govt, Pb. Punjab and Haryana High Court, Chandigarh. All the District and Sessions Judges in the State of Punjab. All the District and Sessions Judges in the State of Haryana. Dated: Chandigarh the 5th February, 1991.
regarding introduction of Punjabi/Hindi for official use in subordinate Courts. for which it was being used immediately before the aforesaid date. provisions in respect of the State of Haryana. Section 137 and Rule 9 of the Code of Civil Procedure, 1908 in this regard. This is for your guidance please.